I'm taking time mid-week as I prepare revisions to my December quarter estimates and resulting updates to my AAPL price targets and forecasts for a comparison of Apple's revenue growth vs. growth in the company's operating expenses. Outside of the cost of sales (the costs of products sold), operating expenses represent Apple's largest cost segment. Comprised of R&D expenses and selling, general and administrative expenses, in fiscal year 2010 operating expenses consumed about 11.2% of Apple's reported revenue. From a high of 12.2% of revenue in the second fiscal quarter to a low of 10.2% of revenue in the fourth fiscal quarter, operating expenses have an direct and material impact on Apple's earnings and pace of earnings growth. In fiscal year 2010 Apple grew revenue 52% and earnings per share by an impressive 67%. Contributing to a pace of eps growth greater than the pace of growth in revenue was Apple's ability to keep the pace of growth in operating expenses well below the pace of growth in revenue. 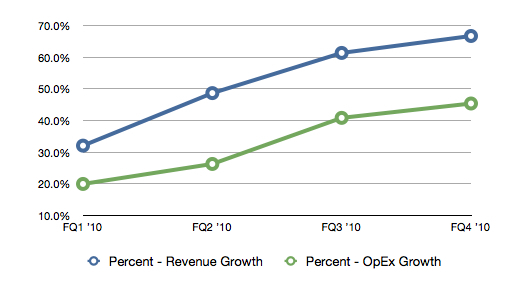 The graph and table data above illustrate and detail the differing rates of growth of revenue and operating expenses. In fiscal year 2010, revenue rose 52% while operating expenses grew 33% year-over-year. It's interesting to note as the pace of revenue growth increased sequentially through fiscal year 2010, Apple maintained a relatively consistent differential between the two growth rates in fiscal quarters 2, 3, and 4. In the first fiscal quarter of FY 2011 I forecast revenue growth of about 70% and I currently forecast the pace of revenue growth for all of FY 2011 at close to the first fiscal quarter's pace of growth. Consequently, I expect operating expenses to fall below 10% or reported revenue in FY 2011, further fueling eps growth at a rate that exceeds revenue growth. My updated first fiscal quarter estimates will be posted early next week. For a comprehensive review of Apple's financial performance over fiscal years 2009 & 2010, please see the Posts At Eventide Resource Guide for Independent AAPL Analysts posted on Sunday.